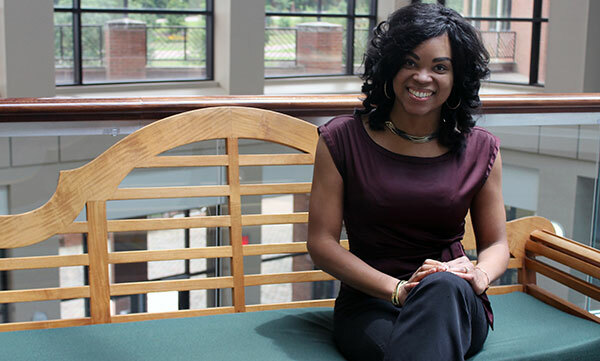 Dr. Simone Phipps conducts groundbreaking research into the contributions of minorities to the field of management. Full Name: Dr. Simone Phipps. Title: Assistant Professor of Management, School of Business. Degrees: Bachelor of Science in Management Information Science from Claflin University, Master of Business Administration from Ohio University, Ph.D. in Human Resource and Leadership Development from Louisiana State University. Describe your service to Middle Georgia State University and the community at large. "I am very passionate about management history, the contributions of minorities (both gender as well as racial and ethnic) to the development of management as a discipline, and the interrelationship between organizational management and society. In fact, my co-author and I were recognized by the Academy of Management for publishing 'groundbreaking African-American Management History Research' pertaining to management necessities. Some of this research has also been included in prominent management textbooks. In addition, I recently presented relevant, but also percievably controversial research that analyzed the business of black beauty to determine whether it could be lauded for promoting social entrepreneurship or criticized for endorsing social injustice. "In terms of teaching and service, I am a strong believer in student involvement and engagement. Guest speakers from well-known corporations as well as entrepreneurial ventures are invited to my classes so students can ask questions and hear from them how management theories are applied in practice. Every fall semester, I coordinate the Knights’ Business Battle, a business plan competition inspired by Shark Tank. The “battle” allows students to hone their creativity, determine venture feasibility, craft a mini business plan applying the knowledge they have gained about entrepreneurship, and develop their presentation skills since they do present their plans to a panel of judges, which, over the years, has included MGA faculty, Small Business Development Center consultants, banking executives, and successful entrepreneurs. Furthermore, I serve as the advisor for the Society for Advancement of Management, which is a student organization with the aim of increasing management skills and expertise. My principal community service endeavor involves the Boys and Girls Clubs of Central Georgia, where I serve as an instructor for the 'Money Matters' and 'Career Launch' programs." What attracted you to a faculty position at Middle Georgia State? "Almost six years ago, after researching the University and meeting some of the members of the MGA family, I saw the position as an opportunity to be a part of the growth of the School of Business and MGA as a whole, and I was excited about working for an institution with a cohesive, people-oriented culture. I also got the impression that as an enthusiastic academic, I would be able to have the much desired autonomy to contribute to teaching, research, and service in ways that I deemed important according to my philosophy. Having that academic freedom was very vital to me." What do you like best about teaching at MGA? "THE PEOPLE! I love my students and I love my colleagues. Some years ago, I remember telling one of my guest speakers that 'when I come to work, I feel happy.' That statement is still true today." In your opinion, what does it take for students majoring in your discipline to be successful these days? "Students need to be prepared, to think critically, and to be consistently diligent. Preparation is a key factor. Don’t just turn up and expect someone to provide you with all the answers, and tell you exactly what to do. Take the time and effort to do your own research and develop sound ideas. It shows you’re interested and competent, and it will gain you respect. In my discipline, problem-solving is critical. Therefore, you have to be ready to think beyond what is easily perceived on the surface, and be analytical. The readily available alternative is not always the best solution. Moreover, hard work is crucial for success. In real life, people usually don’t have victories simply handed to them. Also, it is important to mention the need to work hard constantly, especially for something meaningful. Do not think once is enough. Failure is an inevitable part of success. Therefore, if you fail, persist, and work harder." What would students be surprised to learn about you? "Honestly, I’m not sure what would surprise them. I think that based on my introductions on the first day of classes, and our interactions, they should know me quite well. I like sports (playing tennis, watching soccer, basketball and college football), music, and dance, to name a few. I was actually a contemporary dancer (a very long time ago). I also played the violin (a very long time ago). I still play the piano."